Built by bullets, dynamite, and blood-stained spikes! The South has just seceded from the Union and the nation teeters on the brink of Civil War. 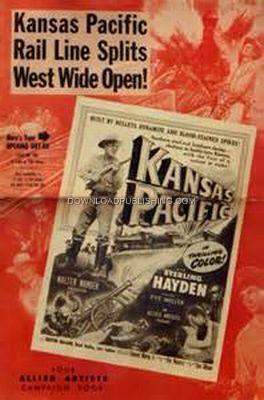 Southern Saboteurs have stopped construction of the Kansas-Pacific Railroad by dynamiting the tracks, keeping it from crossing Kansas and on to the western frontier. The North wants the railroad built as fast as possible in order to supply their frontier forts before War breaks out. Army Captain John Nelson (Sterling Hayden), is put in charge of Operations and is sent undercover wearing civilian clothes. Nelson romances the forman's daughter while contending with Sabotuers that are becoming more violent in their attacks.